(Photo: REUTERS / Sergio Moraes)Lifeguards patrol offshore as Catholic pilgrims await the arrival of Pope Francis on Copacabana beach in Rio de Janeiro July 25, 2013. Pope Francis is on the fourth day of his week-long visit for World Youth Day. Hundreds of thousands of people have gathered the Ecuador port city of Guayaquil to greet Pope Francis, the day after he arrived for a three-country trip to Latin America. It is second visit by the Latin American pope to the region since becoming pontiff in 2013, Francis will also go to Bolivia and Paraguay. City officials said a million visitors had travelled to Guayaquil to see the Pope, the BBC reported, before the pontiff was to celebrate Mass on July 6. A Vatican official estimated that half a million people lined the streets of the Ecuadorean capital, Quito, on Sunday. Thousands of people waited for hours on the streets of the capital, Quito, to welcome the Pope on a trip that Vatican officials have said will focus poverty and the gaps in wealth and living conditions. "Progress and development must ensure a better future for all," Francis said in a speech at Quito airport after he was welcomed by Ecuadorean President Rafael Correa. 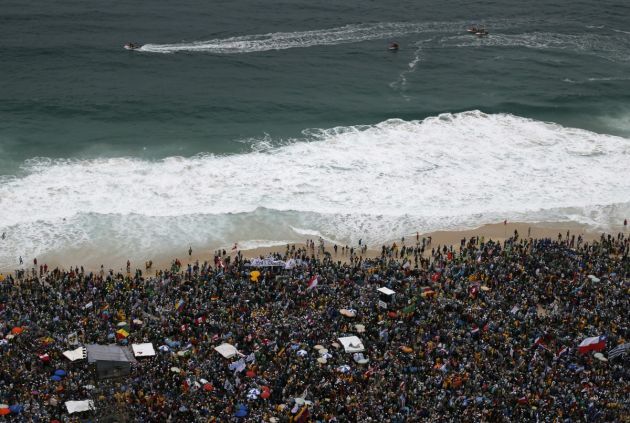 During his 2013 visit to Brazil, Pope Francis drew massive crowds of young people attending the Catholic Youth Conference and Mass on Copacabana beach drew an estimated three million people. Before departing on the trip Francis said the Catholic Church should not have "leaders for life" in its ranks, otherwise it faced the risk being like a country under dictatorship. The 78-year-old pontiff had mentioned in the past he would be prepared to resign instead of ruling for life as leaders of the 1.2 billion-member church have tended to do. "Let's be clear. The only one who cannot be substituted in the Church is the Holy Spirit," the Argentinian-born pontiff said in an address to some 30,000 people at an inter-denominational rally of Christians in St. Peter's Square. "There should be a time limit to positions [in the Church], which in reality are positions of service," he said in his address, The Telegraph reported.